What always was a dream for webmaster Bart, finally has come true. In July 2005 we purchased a brand new balloon in the shape of a rabbit with the name "Funny Bunny". Funny Bunny is a Cameron Z-120 with add-ons and is registered as OO-BXV. You want information about special shape balloons from all over the world? You found it! Of course you will find the "real" special shape balloons. However, I also included classic-shape balloons with add-ons.Often the latter can hardly be called special shapes having just small add-ons. But they can be quite special-shape "alike". 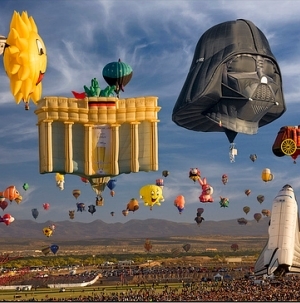 EXPLORE the database and discover the world of special shaped hot air balloons. Actually 1350 special shapes listed! Always wanted to own a special shape balloon? Stop searching, you've found the place where you can find it. If you've got a special shape balloon for sale, please let me know and I'll add it to the list. Find out who I am and how I got involved in hot air ballooning. The database has more than 1200 balloons listed. To keep it up to date I need help. This can be done by supplying information and pictures from new and excisting balloons. On the following page you find a list of missing pictures and unknown balloons. Take some time to have a look on it and see how you can help me to keep the site op and running.